One of the most useful things you can possibly have if you're up the metaphorical creek after dark is a source of illumination: finding firewood (or just not falling over a cliff) is much easier if you can see what you're doing. That's why this survival kit, which packs supplies into the body of a flashlight, could be decent investment. 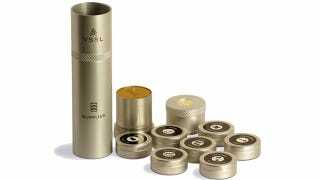 The VSSL (not to be confused with that other tech startup project, Vessyl) is fairly simple: an oversized, waterproof aluminium flashlight body, which is mostly hollow and filled with survival supplies. What you get inside depends on which of the four versions you spring for: Supplies, Shelter, Zombie or First Aid all get you different variations, but they all have the kind of supplies you'd expect from an off-the-shelf survival kit. Best of all, the tail cap is also a compass, which should help steer you in some kind of straight line.